rest of his life. But good stories require forward motion, and the only way out of a dilemma is to make a decision—whether it’s right or wrong. As always, the key to a good decision is making sure it is a direct result of the previous dilemma. 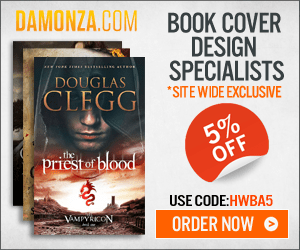 A random, unrelated decision may well keep the plot moving, but not in the straight line your readers want. If your character’s dilemma is about what to make for dinner, his decision needs to be filet mignon and lyonnaise potatoes—not to run down to the hospital and donate blood. 2. To not take action. Both are acceptable choices, but usually, you’re going to want your character to make decisions that will force to him to act. You want a character who causes thing to happen, not one who sits around and allows them to happen to him. That said, there will be moments when a character’s decision to refrain from action will be just as important to the plot and just as revealing of his inner conflict as would be the most exciting of actions. Your character’s specific decision will, of course, depend entirely on the nature of his dilemma. His decision may be anything from I’m going to wear blue socks today to I’m going to sacrifice my life to save everybody in that burning building. Whatever the case, it will translate into a goal that will fit into one of the five categories we discussed in our post on goals. Often, your character’s dilemma won’t be one that can be solved with a simple one-shot decision. In fact, you’ll want to actively avoid too many simple dilemmas/decisions in a row. If the character is faced with one easily solved problem after another, the story will take on a scattered, episodic feel, and readers will be begin to doubt the insurmountability of the odds. This is where the “long-term goal, short-term decision” factor comes into play. If your character’s problem is how to marry that cute neighbor girl, he’s going to be faced with many mini” dilemmas along the way to reaching his ultimate goal. In figuring out your sequel’s decision, look for the first step the character must take. Maybe he does decide to marry the neighbor girl in that first sequel, but he also has to decide on a much smaller, more plausible course of action. In this case, he decides to apologize for yelling at the girl’s dog. Obvious Decision or Long-Shot Decision? Your character’s decisions will shape the plot. If all his decisions are obvious and easily accomplished, the story will quickly lose steam. You don’t want characters to consistently decide upon ridiculous or illogical courses of action. But you do want to keep the odds long and readers guessing. Our lovelorn hero’s most sensible course of action in trying to marry the neighbor girl might be to simply ask her out. Nothing wrong with that, and it could certainly lead to all kinds of interesting story possibilities of its own. But we might be able to unearth some unexpected options by having him make a different decision. Maybe he decides to serenade her outside her window. Maybe he decides to make himself forget all about her. Or maybe, like Anabel Simms in the classic movie Every Girl Should Be Married, he investigates every aspect of the girl’s life in an attempt to casually infiltrate her routines. To State the Decision or Not? You’re always going to want to be able to put your character’s decision into words. Write it down so you have something concrete to build upon. But you may not want to actually state the decision outright in the story. Often, the decision will be clear from either the preceding dilemma or the goal in the next scene. Sometimes, the decision won’t even be made until seconds before the character acts upon it, in which case it will meld with the goal. Don’t state the decision outright if it is in any way repetitious or condescending to readers. If the decision is clear from the context, it probably won’t require an outright explanation. Do state the decision outright if the act of deciding is just as important as the goal (e.g., the decision is a turning point for the character). 1. Is your decision an organic result of your dilemma? 2. Does your decision lead into a strong goal? 3. If your dilemma is a long-term problem, have you narrowed the decision down to the first logical step in solving that problem? 4. Does your decision solve the dilemma too easily or does it lead to new complications, either because the character made the wrong decision or because solving the dilemma created a new dilemma? 5. If your character decides not to take action, is this a logical and important step within the plot? 6. 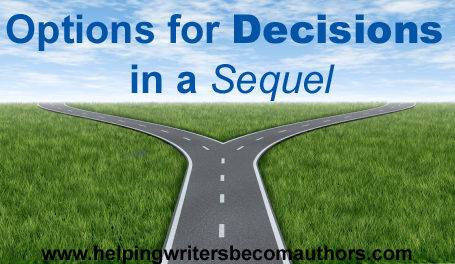 Is your decision important enough to state outright in the sequel? 7. If you’ve stated the decision outright, is it repetitious in light of either the dilemma or the following goal? Pride & Prejudice by Jane Austen: The second chapter ends with the Bennet women’s dilemma about how to meet up with Mr. Bingley. This dilemma is, of course, the first step in the much larger story dilemma of how to get Bingley to marry one of the girls. The decision is never stated outright, but its implication (Mrs. Bennet will invite Bingley to dinner at the appropriate time) is clear both from the dilemma and from the actual dispatch of the invitation at the beginning of the next chapter. It’s a Wonderful Life directed by Frank Capra: Clarence’s dilemma is how to convince George he shouldn’t commit suicide in order to pay off the accounting discrepancy with his life insurance. George’s offhand comment about believing the people he cares about would be better off had he never been born leads Clarence to his decision: he gets Joseph to make George’s wish come true. The decision segues directly into the goal, which, easily accomplished thanks to Joseph, segues right into the next scene’s conflict. Ender’s Game by Orson Scott Card: Ender’s dilemma about how to get out of going to school turns into something much bigger when Graff and his men show up at the house and give Ender the option of attending Battle School. Although Ender’s ultimate decision to go with Graff effectually solves his sequel’s dilemma, it also introduces an entirely new twist, which requires almost the entire chapter to explain and reason through. it upon himself to exceed his orders with this decision is more important at this point than the actual goal itself. This decision will drive the entirety of the plot, as well as Aubrey’s personal character arc. You’ve now learned how to build an entire Scene, from scene (goal, conflict, disaster) to sequel (reaction, dilemma, decision). Put one solid Scene upon another, and before you know it, you’ll have a story that’s solid all the way through! Stay tuned: Next week, we’ll talk about Variations on the Sequel. *For the purposes of this series, “Scene” with a capital S will refer to the scene in general (which can include in its definition the sequel). I’ll use a small s and italicize scene and sequel to refer to the two different types of Scenes. Tell me your opinion: Was your protagonist’s latest decision clear from the context, or did you decide to state it outright in the text? Always, interesting. I love the examples. Really helps! And helps to know I’ve instinctively been on the right track. Writing is a very instinctive process, and our instincts are rarely wrong. Usually, the biggest trick is just interpreting what our gut is telling us. Prior to realizing ber father is in fact already a zombie, the heroine is unsure of his fate or that of any survivors deeper in the overrun compound. The decision she and her group face is to cut their losses and leave or risk it and push further into the base in the hopes of maybe finding other survivors. There is a moment when she realizes she can’t speak for the others but only for herself and states that she must press on in the hopes of finding her father. The others all contemplate and decide verbally to risk it with ber instead of abandoning the story goal. Perfect expression of a sequel dilemma. Thanks! I must say at this point that this discussion is so clarifying. I am familiar with structure (favorites are SAVE THE CAT and WRITER’S JOURNEY) and am aware that each scene should be about something, have a beginning, midddle and end, that it should begin on a positive and end on a negative and all of that. BUT the way you are breaking it down here is just remarkable. I have already bookmarked part one of this and am going g to read the whole series. This will be very helpful in rewrites too to tighten weak and aimless scenes. Remarkable! 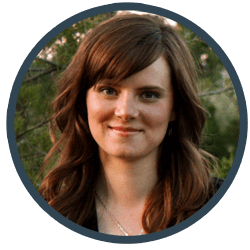 I know this doesn’t answer your question at all, and it’s kind of random but I think its a cool thing running around: The Very Inspiring Blogger award. I’m attempting to make it clear from the context that the girl wants to run awya from her abusive uncle, rather than her directly state “I’m going to run away from my uncle.” As I feel that’s more realistic. She does however plot itself her head though. @Phil: This approach to Scene structure comes to you by way of Dwight V. Swain’s wonderful Techniques of the Selling Writer. Required reading for every writer. @Sarah: If she’s making plans to run away or going over scenarios in her head, her decision will probably be clear enough. The decision my character makes does not lead into a goal, in fact my character decides to give up on it and finds a new goal. The new goal has nothing to do with the decision because he now has a new problem. Will this make my story episodic? It’s just my character is in a lose lose situation. He’s been cornered. He tries to do something but he really can’t do anything at the moment. I’m wondering if this is still considered a reaction. Yes, unless the new goal directly evolves from the previous goal’s disaster, it will be episodic. I looked at my scene outline again, and my new goal is connected to my character’s previous decision thankfully. Is it okay to have a few paragraphs in between before the decision is made? Its more because I have not made it obvious the uncle’s abusive, the fact that she’s running away might seem out of the blue. By the way, I figured out a way to make character profiles less grinding. Instead of saying, “Family makes 20,000 dollars a year.” I instead write a store about how said financial situation directly effects them. 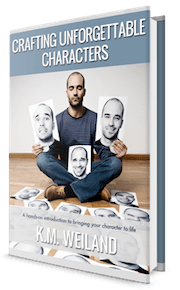 Writing stories – or throwaway scenes – to get to know characters is an awesome exercise. It’s one of the best ways to not just get to know a character, but to get under his skin and find out what it will feel like to write him. If it’s told in a story format with anything approaching a Scene format, the scene/sequel dynamic would definitely be helpful. Decisions, decisions… what´s worst than a character wandering without a goal? No goal, no conflict, no story! I’m wondering about the difference between the planning aspect of the dilemma, and the decision, and the goal of the next scene. They are seeming pretty interchangeable to my brain. Thanks! In practice, they often *are* interchangeable. One can lead right into the other without the reader ever realizing they’re three separate things. Also, the fact that an obvious goal often negates the need for an explicit decision (and sometimes vice versa) contributes to the inherency each part of the scene has to the other. It’s important for authors to be able to pick apart the differetn pieces, but they don’t necessarily have to be obviously distinct within the story. I have a question regarding Decision and point-of-view. And so I wonder if it is alright if it’s not the protagonist, but the antagonist making that ‘decision’ to do whatever that allows the scene/sequel go full circle? Goal: Protagonist (a kid) waits behind a line to board a cruiseship at the new docks. Conflict: Thief pickpockets protagonist’s purse and a chase follows. Disaster: Protagonist gets trapped by thief at the shady old docks, where pirates come to steal little children. Reaction: Protagonist is frightened, and then physically resists getting taken. Dilemma: It is either going along, or get locked up in a box. Would that last part be okay to go with? Or does it have to be a decision made on part of the protagonist? Technically, you always want the decision to be in the POV character’s power. However, things aren’t always so simple as the 1-2-3-4-5-6 cycle of the scene structure suggests. What you’re describing here as scene and sequel, I would actually consider to be just the scene. The rhythm here suggests that the protag’s getting trapped at the docks and put to sleep is all part of the same disaster–with a brief reaction segment inserted. The true sequel will arise when the protagonist awakes and has to deal with the dilemma of his capture.